You’re running in the rat race, jostling with all the other rats for pole position, a vermin marathon of plague proportions. But when you wake up in the morning to head to your dead-end job, don’t you sometimes long for a path less well trodden? Don’t you want a profession that’ll make you want to hop out of bed, instead of hitting the snooze button for a blissful extra five minutes? Of course you do. And the only way to break away from the rat race is to create one of your own. You need to shun the most common path, get out of the job market and start your own business. But that doesn’t mean you won’t run into difficult work. The outliers of society have always had to get their hands dirty to make a clean buck. With that in mind, we’ve come up with a few jobs you can try to reach true financial independence. We’ve all been around cleaners in offices and warehouses. Despite the hard work they do they’re paid pittance, all while lazy office workers rake in cash like greedy dragons snoozing on their hordes. 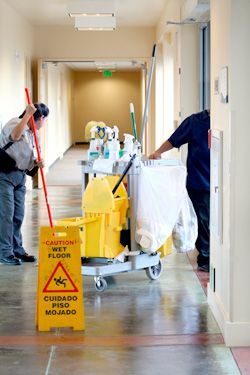 But there are cleaners who can make double the amount of the average office worker – they just have to take a more specialist route. Specialist cleaning is a booming trade, covering everything from clearing away industrial spills to raking up crime scenes. Setting up a business in this area isn’t an easy feat. It takes special knowledge and training before you’re even allowed near chemicals. But once you’re established you’ll be able to take on small contracts and make cash in a cinch. For pointers on how to run an effective operation, take a look at Rentokil’s website. They’ve been active for a long time – use them as the high bar you’ve got to transcend. Clinical trials set most peoples’ hairs on end. Essentially they involve sitting in a hospital bed for a few days or weeks, popping pills that haven’t yet been approved for public safety and seeing what the effects are. Their dangers are, however, greatly exaggerated. Under controlled tests, incidences of illness are rare (although not unheard of). And for your troubles? You’ll receive a few grand in only a week-and-a-half’s worth of work. We all remember Dog the Bounty Hunter, that slightly mad guy who’d capture known criminal and collect a hefty reward. Well, his job wasn’t a fiction. In the US, thousands of wannabe vigilantes make their cash by catching criminals. These are only a few ideas on how you can escape the drudgery of your nine-to-five. What obscure jobs do you dream of? Bounty hunter is my dream job when I was still a kid. I am shocked that there’s really a job like that in the US. Amazing! I wonder how much this job can earn.